Does anyone know how to stop a selected wallpaper from changing position when swiping through the home screen pages? It annoys me that the wallpaper doesn't stay centered on the screen on every home screen page. I really want my selected wallpaper to remain in the same exact position (stationary) no matter what page I'm on. This was never an annoyance on BB10. I'm using BlackBerry Launcher on my Motion. Last edited by The_Dark_Knight_Forever; 01-23-19 at 02:09 PM. BlackBerry Launcher is the issue. If I recall correctly, there's no way to stop it unless you change launchers. Thanks for the info. What Launcher do you recommend? All great options, personally I use Lawnchair but it has wallpaper issues as well where it doesn't always keep the setting, but it's just something I deal with because I like the rest of it. My wallpaper does not scroll when I change pages. Use this pic as a test if you like. Any suggestions on how to edit my current wallpaper to the correct resolution? I use Paint Shop Pro. Post the pic if it's not personal, I'll take a look at it. Sounds like it might be a square pic, which will scroll. This image is a bit off center but I was able to correct it using the native editor when selecting it for my wallpaper. But as I mentioned, it does not stay stationary when I swipe through my home pages. Very small pic, only 640 x 640, which is definitely your problem. Have one similar so I use it on lock screen only. I'll see what I can do, but doubt it can be changed a lot. Yeah sorry. I'm pretty ignorant when it comes to photos & photography type stuff. In the past I've always just found an image I liked & tried to plug it in. If it worked then great but it there was problems I would just have to find another image. I'm trying to stick with this one though if possible. Scrunched it a bit, but doesn't look too bad. Not too bad. Thanks for taking the time & trying with it. You don't have to change the Launcher.. Set the wallpaper with a default App and it won't move on you. I use Quick Pic.. I'm not sure what you mean to do exactly. But I installed QuickPic, opened it, selected my preferred pic, set it as my home screen wallpaper but it still continues to move as I swipe through my home pages. 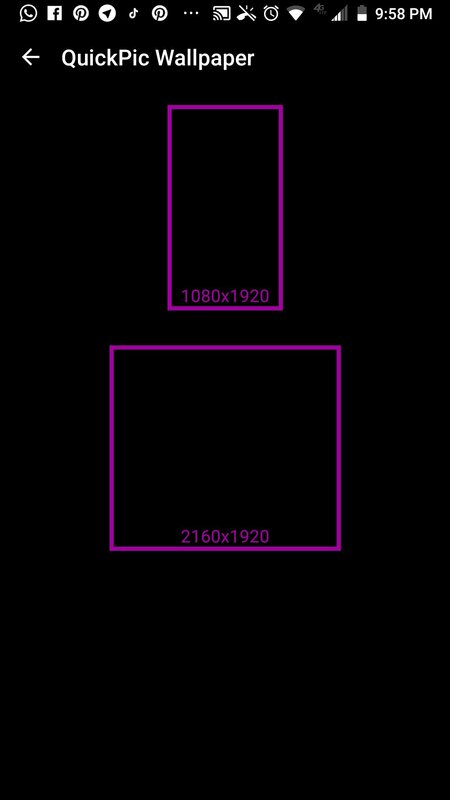 Open up the QuickPic App, find the picture you want and then set it with QuickPic Wallpaper.. Then tap the upper purple box. Either I have the wrong "QuickPic" app or you have an earlier version of it. The one I installed is QuickPic - Photo Manager developed by bokx. This is what it looks like when I try to set the wallpaper. I don't get the choice of sizes either. App icon looks like this.. You can use any Gallery App, I use QuickPic because it allows you to set larger pictures. Worked for me. Thanks for the help. 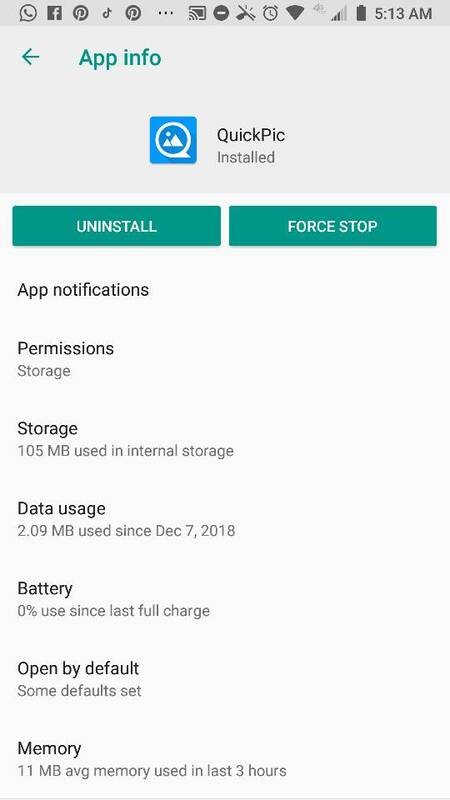 Any idea why this app isn't in the Play Store though? It was as that's where I got it, I think they just changed the name. Really not sure but you can use any Gallery app, just don't use the system settings to set the wallpaper and don't use Google Photos. 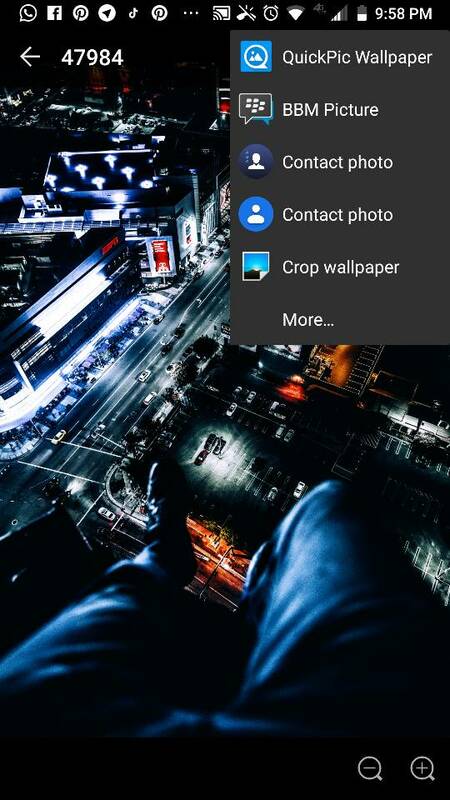 You can zoom the photo you want to use as your wallpaper and do a screenshot on the part you want to use as it. Then, use the screenshot you did as your wallpaper. No need for launchers or any other complicated issue.